Last week at our regular LWRDPC (photo club) meeting, a local photographer named Mac Carraway, was our guest speaker. He demonstrated a photoshop technic called ‘Focus Stacking.’ I had trouble reading the chicken scratches I took during the meeting so I did a youtube search to find instructions. Click HERE to see the video I used. As part of Mac’s demonstration he used photos he had taken of a moonflower vine. I have that same flower growing in my yard. In the past I have taken photos of the flower all opened up. I had never seen the beauty in the half open/ half closed flower until I saw his photos. I decided this morning to give it a shot. I had noticed when I let the dogs out that the flowers were all in various stages of closing for the day. My photo is a stack of 5 different photos. 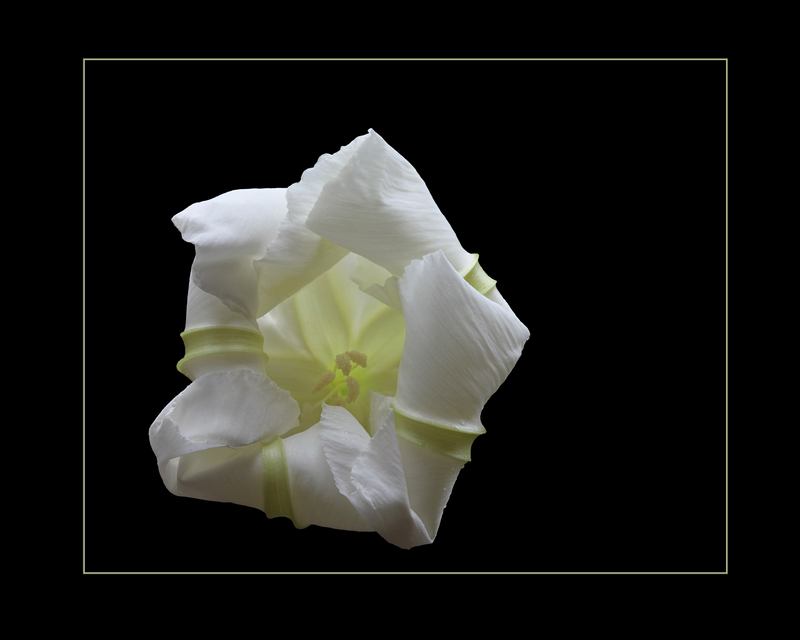 I followed the instructions from the video then used the quick selection tool to move the flower from the photo to a black background. I wanted to use a stroke line to frame the flower but white seemed harsh. Instead I chose a color with the color picker in photoshop. It’s a very light green color from the inside of the flower. It’s not perfect, but I’m happy with it being my first try! I thought it was perfect for the ‘Simplicity’ theme. If any of you local bloggers would like some moonflower seeds let me know. Click HERE to see how to grow them. Categories: Flowers, Lakewood Ranch, Photography, Uncategorized | Tags: 8, focus stacking in CS6, LWRDPC, Mac Carraway, moonflower, simplicity | Permalink. 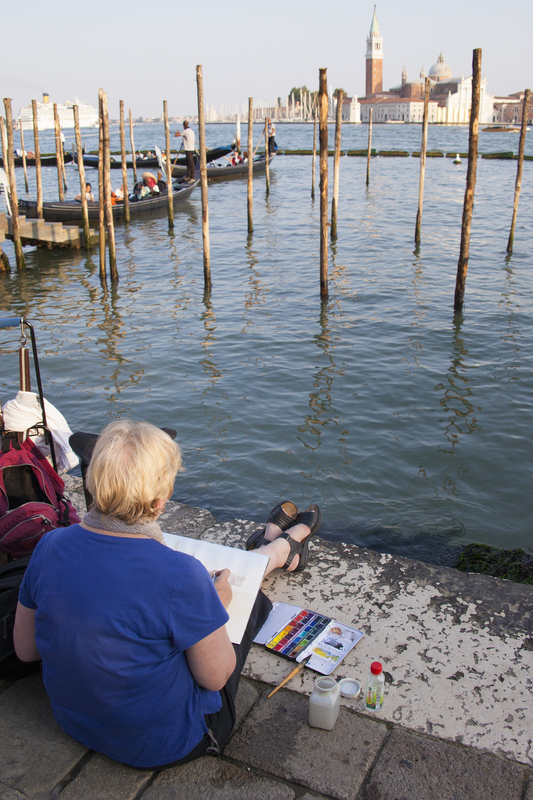 While visiting Venice recently I noticed 2 women setting on the sea wall near Piazza San Marco. 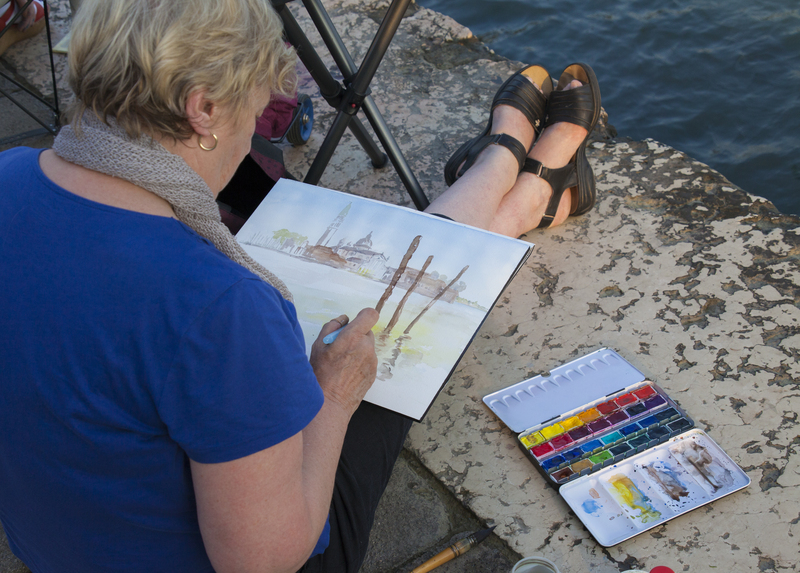 They both had their water colors spread on the ground and were staring off at San Giorgio Maggiore. I walked up behind them with my camera several times to watch their progress. I’ve painted a bit in the past but have never had any luck with watercolors. I never could get the just right balance of water and pigment. All my work ended up being a muddy puddle of brown/gray. I think because of that I really appreciate someone who can master that medium. I thought it might be fun to use a couple photos I took of that artist and show you what her view was. And then I found a photo that I took while coming into port on the cruise ship of the same building. I tinkered with my photo and did my own “Interpretation Of Art.” I did a little split toning in photoshop to give it a little more depth, a little straightening and cropping and Voilà! I think we are all artists. No matter what our tool of choice, we are all creating and experimenting. All to show the world how we interpret art through our eyes. And trust me, the world is a better place because I chose a camera for my tool and not a box of watercolors! Categories: Uncategorized | Tags: 7, Italy, painting, Piazza San Marco, San Giorgio Maggiore, Venice, water colors, Watercolor | Permalink. 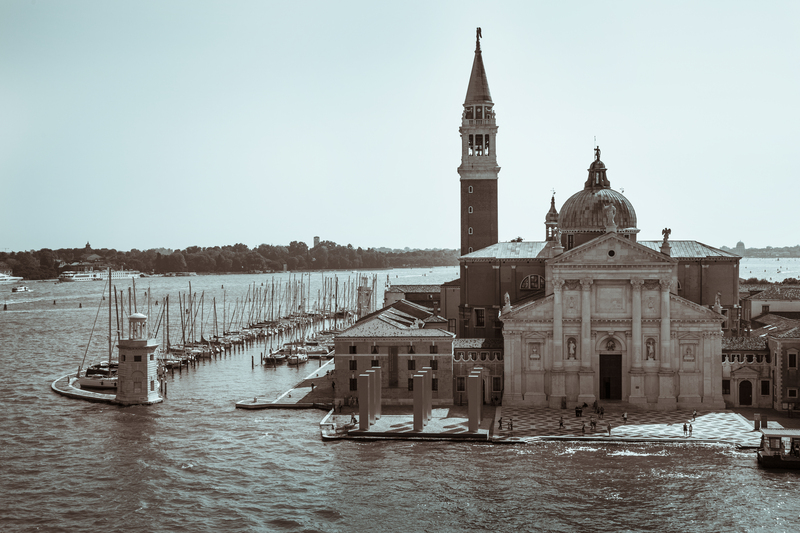 As I write this blog post I am vacationing in Venice, Italy. I am still sorting through photos… I thought this pair of photos would fit my theme this week and maybe give you all a chuckle. I know I laughed a LOT while I was taking the photos. I took the photos in Saint Mark’s Square. If you have been there you know that people are everywhere feeding the pigeons and trying to get a photo of as many pigeons as possible climbing all over you. And ummm no, I didn’t do it. I wasn’t prepared to take the chance of bring a pigeon present back to the hotel with me down the back of my shirt. The photos here are of a family trying to get the attention of the pigeons while the father tried to get the photo. The youngest daughter however, wanted NOTHING to do with it! She was climbing him like a tree to get away from the birds and he was doing his best to balance her while getting the shot. The whole affair was quite funny to watch. 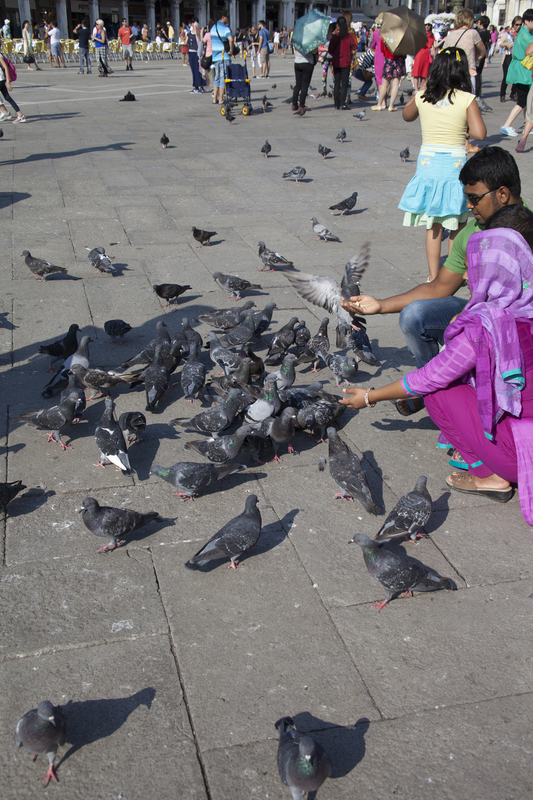 Categories: Photography | Tags: 6, Italy, Pigeons, Saint Mark's Square, Venice | Permalink.